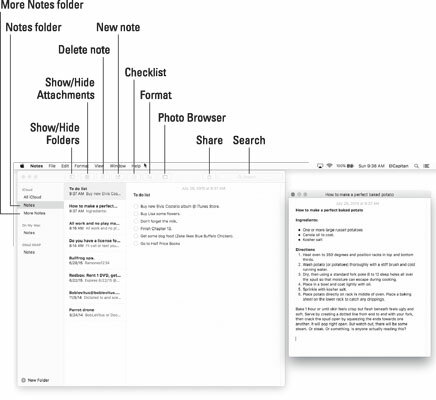 Notes in OS X El Capitan is an electronic notepad for your Mac. A note is a convenient place to jot quick notes, recipes, phone numbers, or whatever. Some notes are shown here. To create a new note, choose File→New Note; press Command+N; or click the button with the little square and pencil in the toolbar. After opening a note in its own window, if you want the note to float in front of other windows so it’s always visible, choose Window→Float on Top. Create folders (Notes and More Notes in the figure) to organize your notes by choosing File→New Folder, pressing Command+Shift+N, or clicking the New Folder button at the bottom of the Folder list. The Notes window must be selected to create a new folder. If a note in a window is active, the New Folder command will be unavailable. So click the main Notes window if the New Folder command is grayed out. Show or hide the Folders list by choosing View→Show/Hide Folders or clicking the Show/Hide Folders button in the toolbar. Automatically sync notes with your iDevice by using iCloud or other Internet Accounts by choosing Notes→Accounts, which will open the Internet Accounts System Preferences pane; then click the appropriate Internet account and enable its check box to sync Notes. Send the contents of a Note via the Mail or Messages apps by choosing File→Share or clicking the Share icon. Print a note by choosing File→Print or pressing Command+P. You can drag and drop photos, PDFs, videos, and other files into a note, something that’s never been possible in Notes before. The new Attachments browser displays every external file you’ve dragged into every note in a single place, making it easier to find things. Click the Attachments button in the toolbar to see this feature in action; click the Attachments button again to go back to your notes. You can add checklists (in addition to bulleted, numbered, and dashed lists), as shown in the to-do list in the middle of the figure, by clicking the Checklist button in the toolbar, by choosing Format→Checklist, or by using the shortcut Command + Shift + L.
You now know everything you need to know to use and enjoy El Capitan’s new, beefed-up Notes app!